Kaidie runs the 2012 Bath Half, UK, and the or her (little) world. My practice-related Fine Art PhD thesis performs a discourse of ‘trans-running’ – running physically and poetically, and running as both subject and approach, concept and action – as a playful methodology to transform our world today. In my written thesis, I proposed that trans-running can enable us to claim ownership of the city and resist political control in the ‘real world’, as well as dodge online surveillance and assume multiple viewpoints in the ‘digital world’. Running physically can cause the ‘runner’s high’, which I argues can create a euphoric and poetic mode of thinking that we can apply to explore discourses. Since ‘discourse’ means ‘running from place to place’ in Latin, and as runners were historically ambassadors, I additionally propose the ‘trans-runner’ as the new ‘running-ambassador’, capable of activating new discourses and creating new knowledge. My studio practice, entitled ‘Kaidie’s 1000-Day Trans-Run 12.12.2009 – 09.09.2012’ consists of a large body of artworks. It features ‘Kaidie’, a ‘trans-runner’ who explores trans-running as a mode of art. In the narrative, Kaidie runs for 1000 days to look for the ‘point of life’. Audiences can run physically or metaphorically alongside, by ‘following’ her on social media, and helping her in her quixotic quest. The artwork itself runs the gamut of media such as film, GPS drawings, ‘tweets’, and durational performance. For the duration of my research, I picked up long-distance running, and played Kaidie. Since its launch in December 2009, my website <3rdlifekaidie.com> has welcomed more than one million unique visitors. A running-ambassador myself, I ‘run’ back-and-forth between discourses to bring to the audience/reader the message of trans-running. Apart from the aesthetics of the hypertext, neuroscience and rhetoric, I draw on the Chinese Daoist wanderers’ poetic, techno-sceptic and anarchic ways to generate a playful, performative practice of writing and art-making. The entire thesis is an artwork that performs the discourses of the trans-runner. It mobilises ‘run’-related idioms, wordplay, alliteration, etymology and correlations like the metaphor. I invite the audience/reader to perform trans-running themselves, to better grasp it. 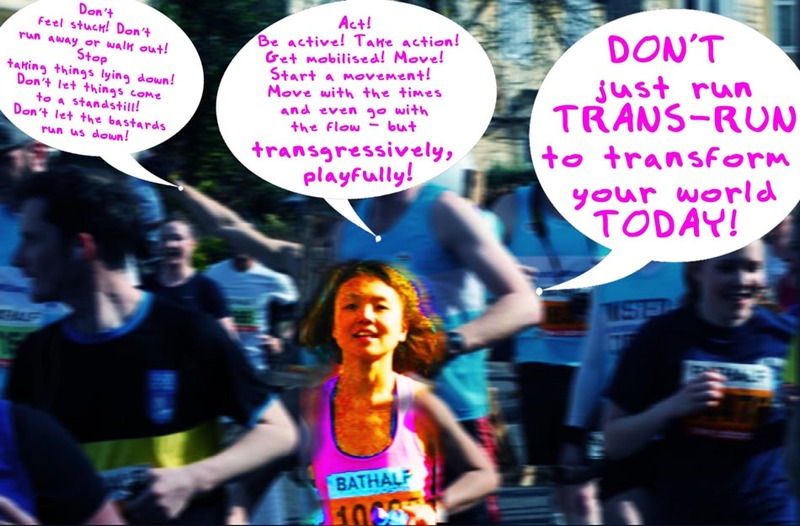 Trans-running aims to be trans-cultural, trans-disciplinary and transgressive. It introduces ‘running’ as a counter to the well-studied tradition of walking, and as a mode of correlating distinct discourses. Utilising non-Western and non-canonical discourses, My research contributes to debates about cultural difference. Integrating theory and practice, it seeks to contribute to the discourses of the ‘Fine Art research’. The beauty of all of this, as you know, is that it has always been here, the amazing thing is that it has been recreated now by accident just in time for yourselves to fall through those gaping holes and fold up the earth…again? Indeed ‘it’ is always there, m4sk 22, and also always not there 🙂 To be deliberate about it, to outline it and to plough through, but at the same time also being ‘natural’ and intuitive and real about it, is the trail I am following and falling in indeed. Come with me! Don’t be shy, Admirer! Come join us in this cacaphony! It’s a party! I wonder if you remember me. We did together a course at UCL to learn how to write phd. I am doing mine on nutrition. I was wondering how yours was coming together? Hello! It’s lovely to hear from you! Even though it’s been quite a while, and even though we’ve been quite dead from quite a while yes we DO remember you – and thank YOU for remembering + thinking of us + remaining fascinated by our third lives too! Dearest Flippo, Keep going, keep running, give your very best shot for the final laps!!!! We are rooting for you!! !